Arianespace has successfully launched the MOHAMMED VI - B Earth observation satellite, developed for the Kingdom of Morocco by a consortium comprising Thales Alenia Space as system prime contractor and Airbus as co-prime. Arianespace’s ninth launch of the year, and the second using Vega in 2018, took place on Tuesday, November 20, 2018 at 10:42 p.m. (local time) from the Guiana Space Center (CSG), Europe’s Spaceport in French Guiana (South America). This launch marks the 13th successful mission in a row for Vega since it entered service in 2012, as Arianespace continues to prove that its light launcher is a perfect match for the requirements of both government and commercial customers. The MOHAMMED VI – B satellite is the second spacecraft launched by Arianespace for the Kingdom of Morocco, within the scope of the country’s Earth observation program, MOHAMMED VI – A & B. It joins the MOHAMMED VI – A satellite which was orbited by Arianespace on November 7, 2017, also using a Vega launcher. The MOHAMMED VI – B satellite will mostly be used for mapping and land surveying, regional development, agricultural monitoring, the prevention and management of natural disasters, monitoring changes in the environment and desertification, and border and coastal surveillance. Including this mission, Arianespace has now orbited 67 Earth observation satellites using its family of launchers: Ariane, Soyuz and Vega, for institutional and commercial customers. From this standpoint, the end of the year is symbolic: after two successful launches in November (Metop-C on Soyuz for EUMETSAT on November 5, and the MOHAMMED VI – B satellite on Vega today), two other launches for Earth observation are scheduled in December: GEO-KOMPSAT-2A on Ariane 5, followed by CSO-1 for the French DGA (Directorate General of Armaments) and the French CNES space agency on Soyuz. 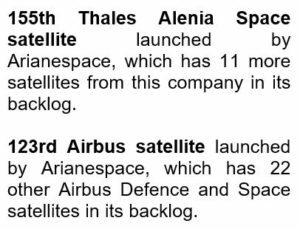 From the total of all satellites launched by Arianespace, 10% were for Earth observation missions, in particular for European programs: Copernicus for the European Space Agency (ESA) and Metop/Meteosat for EUMETSAT. With today’s launch of Flight VV13, Arianespace’s ninth in 2018, the Vega launcher completes its second mission this year and its 13th success in a row since starting operations at the Guiana Space Center in 2012. Arianespace is also gearing up for the future with Vega C, the new generation of this light launcher, scheduled to make its first flight at the end of 2019. Vega C will boost performance in terms of payload capacity (weight and volume), enabling it to carry out an even broader spectrum of missions (from nanosatellites to large optical and radar observation satellites), and will further improve the competitiveness of Arianespace’s launch services. 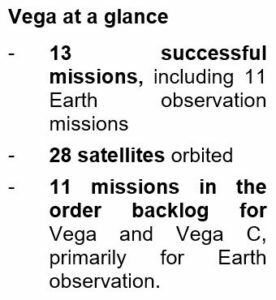 Vega will perform another emblematic mission in 2019, a demonstration flight for the SSMS (Small Spacecraft Mission Service), capable of carrying up to 81 smallsats. With a backlog of 11 missions for Vega and Vega C, including one-third for European institutions and two-thirds in export markets, Arianespace confirms the validity of its launch services for the dynamic market of lightweight satellites in low Earth orbit. Vega C and Ariane 6 will be used in concert to address all market segments beginning in the 2019/2020 timeframe. Shortly after the announcement of the satellite’s orbital injection, Stéphane Israël, Chief Executive Officer of Arianespace, said: “Arianespace is proud to have orbited the MOHAMMED VI – B satellite on our 13th successful launch in a row of Vega since it was introduced at the Guiana Space Center. We are delighted that the Kingdom of Morocco has continued to entrust us with its second satellite, following the MOHAMMED VI – A satellite that we launched successfully last year. Congratulations to Thales Alenia Space, prime contractor for the MOHAMMED VI – B satellite, and to Airbus, as co-prime. With the launch of this satellite today, we are extending a long-standing partnership with Thales Alenia Space and Airbus.